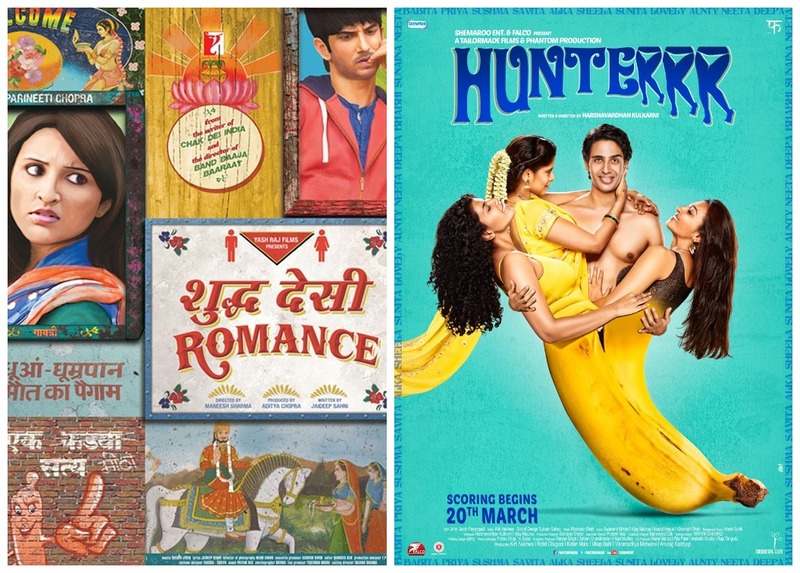 Two recent Hindi films – Shuddh Desi Romance (2013), directed by Maneesh Sharma and written by Jaideep Sahni, and Hunterrr (2015), directed and written by Harshavardhan Kulkarni – try to trace the different contours of modern Indian romance with interesting results. The first film is produced by Yash Raj Films – not just a pillar of the Bollywood establishment, but the very face of the brand of idealist romanticism generally associated with the industry – in a spirit of keeping up with changing social norms. The latter is partly produced by Phantom Films, the self-styled outsider institution that’s building an impressive repertoire primarily targeting cosmopolitan audiences. Varied though they might be in their origin and temperament, they converse well with each other and, I believe, together provide a very good window into the evolution of both culture and the Hindi film industry. Hunterrr, the more provocative of the two and understandably so, follows Mandar (Gulshan Devaiah), a handsome, middle-class urban man in his 30s. Mandar is a ‘player’, constantly in pursuit of flings, who dreads being tied down by marriage but who acknowledges nonetheless that he isn’t getting any younger (which means not that he needs to get married, but that his chances of scoring are diminishing). In Shuddh Desi Romance, Sushant Singh plays Raghu, a street smart man-child working odd jobs, who gets cold feet every time he tries to get hitched. Raghu’s aversion to marriage could only be taken at face value – a fear of the finality of the institution and its increased stakes – because it finds its exact echo in the female protagonist Gayatri (Parineeti Chopra), whose failed pregnancy seems to have made her skeptical of all long-term relationships. Mandar’s marriage-phobia, in contrast, stems for a multiplicity of polarizing forces he is caught amidst. For one, he juggles in vain modern and traditional belief systems, trading in libertarian values while shouldering the weight of tradition in the form of societal expectations of ‘settling down’. Furthermore, the film presents his refusal to get married as his inability to accept the responsibilities that a patriarchal setup requires of him (to earn, to drive, to support a family) while enjoying the privileges that it offers (of unproblematic mobility, of freedom from moral judgment, of unquestioned predation). It is as though he realizes his status as a gendered-being only when standing at the gates of matrimony. To be sure, Mandar’s conquests aren’t as much fodder for male ego-polishing as responses to genuine carnal urge, free of social-programming (as is evidenced by the freedom of the men surrounding him from such a perennial urge). But the ease with which he can go about these making these conquests is what I think is invoked here as privilege. This privilege, in Hunterrr, manifests in Mandar’s relationship with the space he moves in. He sexualizes the zone around him wherever he goes. The hunter, one might say, examines his space carefully and prowls before making his move. Quotidian gestures by women become triggers for him, while the same gestures retain their banality when the men do it. The film partakes in this sexualization in such a way that we always know when we are to share Mandar’s perspective (and, at times, when we are to break away from it). On the other hand, he senses his mastery of space thwarted in the closely knit residential complex he lives in during his university days in Pune. He finds himself always under scrutiny, continuously challenged to carve out a judgment-free space where he can maintain his love life. The anonymity offered by city life is undone by the closed nature of the residential complex. Space in Shuddh Desi Romance, on the contrary, is more clearly demarcated. The two leads who refuse marriage almost literally live in an ivory tower. They occupy a penthouse on one of the tallest buildings in a mixed-use neighbourhood in Jaipur. This apartment of non-marital coupledom, cloistered from the prying eyes on the ground and free from traces of the characters’ past, stands in direct contrast to the horizontal sprawl and constant scrutiny of the wedding parties the two attend frequently. The bathroom, which figures prominently throughout the film, is a transitional zone of no-morality that links these two kinds of spaces that function according to their own value systems. But these separate spaces, in themselves, are free of gender hierarchy, unlike the masculine spaces of Hunterrr. Shuddh Desi Romance keeps emphasizing the equivalence between its characters, who physically and figuratively take each others’ positions throughout the film. Raghu, moreover, is only too glad to share responsibility with Gayatri. But then all is not egalitarian in the film’s trajectory. Early in the movie, Raghu runs away from his wedding, leaving his fiancée Tara (Vaani Kapoor) stranded. Later, Gayatri deserts him in their wedding. Tara tells Raghu that Gayatri left him because she just wouldn’t have been able to imagine life with a man who fled his wedding. Raghu is, by this logic, guilty not just for what he did to Tara, but also for what happened to himself. Raghu buys into this twisted rationale and carries the double-guilt for the rest of the film, not knowing really how to comprehend his status as a victim-aggressor. This, in other words, is the famous blame-the-victim manoeuvre used on a man for his failure to ‘man up’. It is no wonder that Raghu is passively held hostage by both women in the end where he ends up the guilty party no matter what he does. The film’s view of marriage is decidedly reductive, compares as it does the institution to a house locked from outside. In Shuddh Desi Romance, weddings are literally simulacrums – Goyal saab’s (Rishi Kapoor) firm provides fake invitees for hire for brides or grooms whose parents have deserted them because of their choice of partners – in which, we are told, the double standards of Indian culture come to the fore. The film, it needs to be said, pats itself on the back now and then for its radical stance and there is some amount of vain posturing at work here. Nevertheless, Jaideep Sahni, who is growing from strength to strength with every movie he writes, populates the film with sharp observations about the role of ego in non-committal romance and with characters capable of casual cruelty. Shuddh Desi Romance is, without question, the more accomplished of the two films. Its fine-grained structuring that relies on repetitions, doublings, mirroring and minor variations on major motifs – reminiscent of the work of Korean filmmaker Hong Sang-soo – renders the film very robust. Its use of extra-diegetic talking heads, where characters tell the viewers in direct address what’s going through their head, is never too clever, as it typically is when the device is employed. Actors are capable and personal enough to hold interest even in long takes. More importantly, the film unfolds as a string of fully fleshed-out scenes, instead of vignettes or impressions as is too common nowadays, and this greatly cuts down the possibility of narrative flab. This, unfortunately, cannot be said of Hunterrr, whose scattershot structuring and juvenile inserts of fake scenes cry frivolity. It’s a film that wears its wide-ranged cinephilia on its sleeve and belongs alongside the movies of Anurag Kashyap (who must hold some sort of record for the amount of second-unit material he uses in his films). The early sequences portraying Mandar’s childhood are vivid and refreshing, but its shuffling of narrative timeline tries to build a dramatic causality where none exists. Few films swing so wildly between honesty and disingenuousness as Hunterrr. A spate of genuine notes lie scattered amidst false ones. The conversations, evidently, have the frankness of lived experience. So does Mandar’s conflicted view of himself as an everyman to be treated ordinarily and a pathological exception to be specially understood. On the other hand, there is a completely unwarranted death that is thrown in simply to add gravity to the flighty proceedings and which is immediately undermined by a cut back to flippancy. That said, the film also contains what must count as one of the most graceful portrayals of romance in all of Hindi cinema, in the affair between Mandar and Jyotsna (Sai Tamhankar), the housewife next door. There is a nobility and tenderness in this segment that is very, very rare to come by in movies. The liaison is, of course, transgressive but is devoid of the cynicism and sleaze that it usually accompanies it. In their relationship, Hunterrr captures an intimacy that can be evident to no one in the world but the two involved. The scene where Jyotsna tries out the saree that Mandar buys for her radiates an image all too familiar of a personality rubbed down and dissolved by the weight of the mundane. When she confronts him for the last time and he tries to convince her, a little too forcefully, that something can be worked out, she tells him “You ran away, but where will I run?”. It’s the one point where Mandar realizes, despite looking eye-to-eye with Jyotsna, the insuperable gulf of tradition and culture that separates the two; a moment so personal that, as Baradwaj Rangan put it once, that you want to look away. What did you think of Masaan? I really liked MASAAN. It shows a maturity and compassion that is absent in a lot city-driven cinema. I thought it was a kind of anti-BOMBAY VELVET, in that everyone wants to get out of the cyclic time of the ancient city to the linear time of modernity. But thankfully this wasn’t a cynical view of Benaras. The film seems to recognize that bad things can happen to people despite best intentions. Thoughtfully written analysis, kudos! Disagree with a few things, but to each his own opinion. Hey, did you get around to seeing COURT and TALVAR? Thoughts?